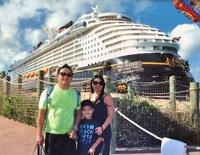 We had chosen this cruise because our son loves Mickey and the characters. All I can say is they go above and beyond. We chose the shorter trip because my wife has major motion sickness (she took a patch). Everything was so clean, events were well organized, so much to do, food was very good for all ages. There was a hiccup our first night dining as we were the late group. The second night and on we were Wow&apos;d. Then they seated us in our private table and wow, the staff was so good. One of the best staff&apos;s I have ever had the pleasure to deal with. Very interactive with our son and us and you can tell they were in sync as a team. They knew how, what, and when we liked in our orders to a T. We expected good service and received the best, as in the gourmet restaurants we had been to. The staff was excellent, they personalized everything, Bahama excursion to Atlantis is a must. 99% of the trip you had barely noticed that you were on the ship, moving. Bahama excursion was well laid out and organized. We were able to enjoy the aquarium, beaches, casino (no), and food that was located there. Food and beverage to purchase but wow, you can spend a whole day there. We felt safe and secure as the staff at Atlantis welcomed you also. Pirates theme night was awesome as my son enjoyed the live shows, movies while he swam, and of course the all you can eat ice cream (he took advantage of that). If you have younger children, it is a must for Oceanaire&apos;s club. We were kind of wary to let him go by himself at first..but boy..it was pulling teeth to get him to come out. He always wanted to go back. He loved Star Wars, how to draw, and Toy Story theme areas. He made many friends there. Disney Castaway..what can you say. Bring your snorkel gear, find hidden treasures, swim, sunbathe, and enjoy such a relaxing time. Food is good. My son loved it. "Best time of his life." Cabin was nice, ok in size. We did a Veranda...we had spent only 10 minutes using it. Probably will skip out next time as we had spent 99% of our time exploring, in the pool, activities, and eating. You will almost never be in your room. We are not big cruise folks, we prefer hotels and site seeing but wow, we will definitely go back. We may go again this year. We had chosen this cruise because our son loves Mickey and the characters. All I can say is they go above and beyond. We chose the shorter trip because my wife has major motion sickness (she took a patch). Everything was so clean, events were well organized, so much to do, food was very good for all ages. There was a hiccup our first night dining as we were the late group. The second night and on we were Wow&apos;d. Then they seated us in our private table and wow, the staff was so good. One of the best staff&apos;s I have ever had the pleasure to deal with. Very interactive with our son and us and you can tell they were in sync as a team. They knew how, what, and when we liked in our orders to a T. We expected good service and received the best, as in the gourmet restaurants we had been to. The staff was excellent, they personalized everything, Bahama excursion to Atlantis is a must. 99% of the trip you had barely noticed that you were on the ship, moving. Bahama excursion was well laid out and organized. We were able to enjoy the aquarium, beaches, casino (no), and food that was located there. Food and beverage to purchase but wow, you can spend a whole day there. We felt safe and secure as the staff at Atlantis welcomed you also. Pirates theme night was awesome as my son enjoyed the live shows, movies while he swam, and of course the all you can eat ice cream (he took advantage of that). If you have younger children, it is a must for Oceanaire&apos;s club. We were kind of wary to let him go by himself at first..but boy..it was pulling teeth to get him to come out. He always wanted to go back. He loved Star Wars, how to draw, and Toy Story theme areas. He made many friends there. Disney Castaway..what can you say. Bring your snorkel gear, find hidden treasures, swim, sunbathe, and enjoy such a relaxing time. Food is good. My son loved it. "Best time of his life." Cabin was nice, ok in size. We did a Veranda...we had spent only 10 minutes using it. Probably will skip out next time as we had spent 99% of our time exploring, in the pool, activities, and eating. You will almost never be in your room. We are not big cruise folks, we prefer hotels and site seeing but wow, we will definitely go back. We may go again this year. Cabin was nice an cozy. Beds were very comfortable. The service for our rooms was excellent. Jaime knew our names every time he used it. Very clean and welcoming. Towels were always replenished and replaced with clean ones. Clean clean clean.